2. Finely slice the lemon and places slices on the base of a baking tray. Lay your seabass fillets, skin side down on top of the lemon slices. 3. Scatter some rosemary leaves over the seabass, and drizzle with 2 tbsp Filippo Berio extra virgin olive oil. 4. Add ½ cup of water to the tray, which will allow the fish to steam. 5. Cover the tray in tin foil, and cook in the oven for 12 minutes. 6. While the seabass is cooking, measure 400g couscous into a bowl. Cover the couscous with boiling water so there is about 1cm of water lying above the couscous. Add 1 vegetable stock cube and stir. Leave for 10 minutes to absorb. 7. Once the couscous is done, finely chop up your bunch of parsley and stir through. 8. Once the fish is done, remove from the oven, take off the tin foil and pour the juices over the couscous. 9. 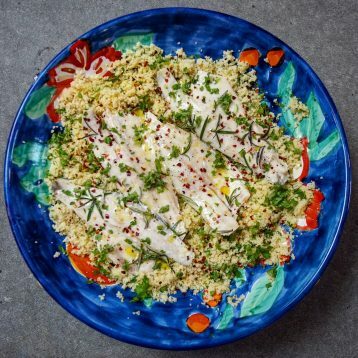 To serve, lay the seabass over the couscous. Scatter some more chopped parsley over the top, as well as a sprinkling of chilli flakes and 2 tbsp Extra Virgin olive oil.